A bookring is up for this book. Join in! Although all his books show increasing relations to each other and the structure and events and basic topics he deals with recur time and again, Paul Auster is one of my favourite authors. You just know that he has woven a lot of hints and allusions and secret stories into it. It is a book which (like all his novels) one can read and leave it or -the real thrill- one can go about trying to find out the secret stories behind the countless names and things and places mentioned. Sometimes I find him a bit over the top, though and reading his stuff too often is... maddening. Oh, for the brainiacs amongst you: He is a postmodernist novelist (if you want to go into that), joining the bigger part of the postmodernistic critereias in his work. Got this in the post today, thanks! Will read, review and send to next person in the bookring! I love books that feature the craft of writing within the story, and I wasn't dissapointed with this. It's a book within a book, within a book. With other types of writing thrown in. I think Auster is the only writer I know who uses footnotes in his fiction. Sometimes, the second and third plotline was more interesting than the primary one, and I thought the ending, after all the twists leading up to it, was arrived at a bit too easily. However, a great read. When you're finished you'll think you've accomplished something good. I would also recommend Book of Illusions to anyone who reads this, if you haven't discovered it already. Sent to book-monster on 13/5! I received in the post yesterday. I finished this before work this morning (I'm not sure reading in the morning is the best way to get myself to work at a reasonable time). It was a wonderful book filled with literary games. My only reservation was that the ending seemed to happen too quickly. I'm waiting to hear from CatharinaL with her address. The book arrived this morning -- thanks for sending, book-monster! I love the web of narratives in Auster's fiction. You start with a simple story, yet end up lured in a stronghold of layered plotlines with internal and external links. 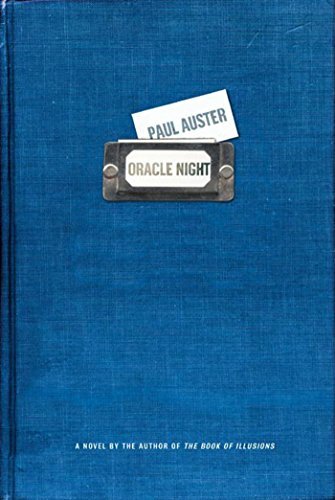 Oracle Night was written in a considerably lighter tone than some of Auster's previous work--after The Book of Illusions, I almost expected him to turn untenably somber. ON was deceitfully easy to read: kind of minimalistic on the Auster scale. It takes a genius to create something like this. 17/06: Sent to nice-cup-of-tea in Zürich. Received this in the post today from CatherineL - thanks very much! Will read this week and then pass on! I agree with all the other journallers here. It's an extremely clever book about stories and writing and plot lines. The plots are developed and resolved within each other, so much so, that sometimes I had to really concentrate on what I was actually reading! The structure reminded me of russian babushka dolls, in that you start one plot, start the next, and the unwrapping continues until you get to the heart of the narrative. I agree that the footnotes were unique, but I sometimes found them distracting. Or perhaps that was why he used them?? The time travel script had echoes of "the Time Travellers Wife" which I've read recently, although of course it should be the other way round. The other thing I noticed was the idea of time travel agents who monitor books, to check that the words aren't rewriting themselves, and that history isn't being changed. I wonder if this is where Jasper Fforde got his ideas for Thursday Next and the LitSpec Ops from?? "A Blue Team member had to be curious, a reader of books, and aware of the fact that he couldn't bend the world to the shape of his will. An astute observer, someone capable of making fine moral distinctions, a lover of justice. A Blue Team member would give you the shirt off his back if he saw you were in need, but he would much rather slip a ten-dollar bill into your pocket when you weren't looking." What a perfect description of a bookcrosser! I loved the basic idea of a notebook that aids your writing, and I loved the description of the stationary store, and all the goodies in it. I finished the book late last night (well early this morning really) as I couldn't sleep. Bizarrely, this whole book made me think about the act of writing, of how authors develop their craft and find their ideas. Don't laugh, but I then had an inspiration on how to finish a section of writing for my thesis. I got home, scribbled some notes in my favourite black leather Paperchase research notebook, and then went back to bed and fell asleep!! Finde-Fuchs, thanks so much for this bookring, what a special book! i just received the book at the zürich meet-up. wow the first meet-up i´ve ever been to. now i know some of the faces and not only the screen names. thank you nice-cup-of-tea for bringing the book with you and thank you for the tea, too! i loved this book. i read it in three days, which means a lot when i take under consideration that i´m visiting friends and family right now in germany and switzerland and am not spending much time alone after all. a book that is read by me in such a short time is almost always one in which i get caught up. this was the first paul auster book i´ve ever read and it reminded me a little of ian mcewan, especially of his ´the comfort of strangers´. the relationship between the married couple was depicted in a similar way. the comfort and trust as well as the intimacy between them reminded me of the two protagonists described in mcewan´s work. what stroke me most about the book was auster´s modernist approach - as already mentioned by finde-fuchs - the loose ends, a story told that vanishes, another which is left to be truth or fiction depending on how the reader imagines it, the generic approach to culture (buying a portuguese notebook from a chinese man in brooklyn,...) and all coming somehow together in the end. a beautifully written book that i hopefully didn´t spoil too much for the future readers! i liked this book a lot and will read more of paul auster´s work in the future. thank you for sharing this book. i will send it on to lakelady2282 as soon as i receive her address. i figured out that lakelady lives in australia. as i am in germany right now i decided to wait and take the book home with me to australia before sending it to lakelady. this will save me money and i don´t think that it will take much longer as i will leave germany tomorrow and hopefully am able to send it her way in the end of the week. 25/07 i finally put the book in the mail this morning... sorry for the delay. Arrived today. Looking forward to reading it. Thank you finde-fuchs and outofreach. An interesting multilayered novel- good writing , but not sureabout supernatural elements(Chang's store). Good to read a book by a U.S. author with les than 400 words! I did find the main character a little selfindulgent. New York, written inlucid readable style, but I am not too sure about the 'maic' elements The book which almost wrote itself - the stationer's shop etc. None theless I enjoyed it a lot, and it was good to find a contemporary American authorwho wrote less than300 pages. Seems I have caught a well-travelled book and on reading the comments of others who have caught it on its way around the globe, it promises to be an interesting read. It took me too many interrupted reading sessions to really get my teeth into it. Accidentally left it behind on a recent weekend away and both host and her daughter read it before returning it to me a few weeks ago(one enjoyed it, one did not). I loved all the stories within stories, and I really should read it all over again in one sitting, to absorb the excellent writing of Paul Auster. Picked up at Live Sparks Cafe. I read this book in less than 12 hours. I, too, loved the multi-layers, although, if I put the book down for some time, when I came back to it, I wasn't sure which layer I was into! I found the footnotes - carrying over a few pages, while the story stayed behind - annoying. Off to woosang via BookRelay. Did you teleport this book?? I think I only accepted it yesterday and here it is at my house. I think this sets an all time Aust post record!! Hard to rate it 7/10 or 8/10. I loved the characters in this book and enjoyeed the fact it didn't have a happy happy joy joy ending. I thoughly enjoyed the book within a book, and found it hard to put the book down. I am so glad I had the chance to read it and thnaks to everyone who helped get it to me. With some of the previous entry I was concerned that I would find it hard or strange to read, but it was easy and the writing was simple to understand. I forgot to mention that I also found the footnotes really annoying, espcially when thay went over many pages. I did appreiciate that they provide important info about the history of the characters, but I am sure another method could have been used. Sending to a lady in the US who is part of a Yahoo group I belong to. I have no iead if she is a bookcrosser, but I hope she looks at this book's adventures, as it has almost circled the world!! I'm looking forward to reading this on the plane this weekend. Thank you for sending it to me! Ok, I guess I wasn't logged in, so, I'm logging my find as me now. I'm looking forward to the book. Thanks for mailing it to me.